Last year, I brewed my first Scottish 80 Shilling Ale, right before competition time. I thought it was a decent beer, though by far not the best I'd ever had, but it did poorly in competition. This year, I am hoping to redeem myself with a new recipe. I'm looking to hit all the BJCP flavor and aroma notes. It should be a malt-forward beer with minimal esters. Hops should be present enough to balance the malt. The malt itself can be rich, toasty, and caramelly. Aroma should have low to medium maltiness, low to medium caramel, and some butterscotch is allowed. The best examples have a light fruitiness. They may have a low hop aroma, with English-style earthy, floral, citrus, and spice to it. It should be clear, with a low to moderate creamy off-white head. The color should be pale copper to medium dark brown. At the end of brewing, the keg held less than 2 gallons of wort at 17 Brix (which with my refractometer adjusts to about 1.072 SG). I diluted this with distilled water to get down to the intended range, but overdid it slightly. I ended up with an original gravity of 14.2 Brix or 1.059 SG. That's close enough for now. The Edinburgh yeast likes a fermentation temperature range of 65-70F, so I configured the InkBird controller to hold 65F for three days, then 70F for ten days to ensure it finishes out. Given the large fermenter, cold ambient basement temperature, and small recipe volume, I don't think I will need cooling on this one. If it does get a bit hot, that may contribute some esters that could enhance the beer if not overdone. I'm concerned that the roasted barley in the recipe could add a roasty note to the beer that takes it outside the style definition, but we'll have to see. The mix of Crystal/Caramel and Melanoidin malts should deliver some malt complexity. 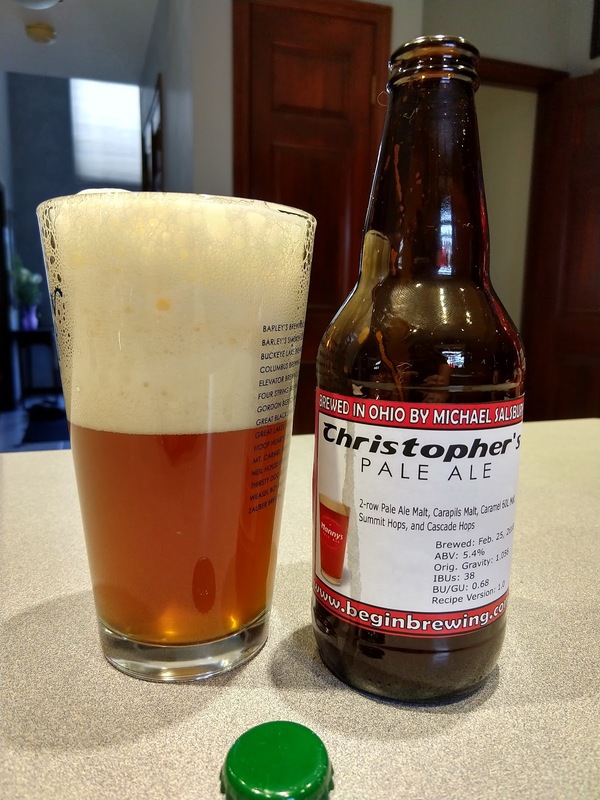 Hopefully the 10-minute addition of Bramling Cross contributes good flavors and not too much bitterness. I'm hopeful that the oats will deliver a bit of body and mouth feel, since it always seems like my beers in this gravity range are thinner or better-attenuated than they should be. During the brew, the Zymatic did generate a fair amount of foam, enough that there was a significant puddle on top of the tray but no significant spillage. 03/27/2018: It's roughly 24 hours after brewing and I'm seeing no activity in the airlock. Then again, there is a lot of headspace, so there may not be much airlock activity to see. 04/7/2018: Despite a lack of visible airlock activity, the beer appears to have finished fermentation. I now need to treat it with gelatin and then get it bottled. Final gravity is registering as 7.9 Brix, which BeerSmith is calculating (after adjustment for my refractometer) to be 1.014 SG and an ABV of 5.7%. In 3-4 days I plan to bottle with carbonation drops. 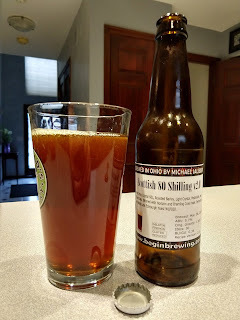 04/11/2018: The beer is looking nicely clear, so I decided to bottle it. I ended up with about 14.5 bottles (12-ounce variety) of this one. I harvested the yeast for future re-use. The aroma has a hint of butterscotch to it, and the flavor seems pretty good, too. There is a nice malty backdrop with just enough hops to balance it, but it's not hop forward. The bottles were placed in a 76F "hot box" to condition. In about ten days, I hope to try the first sample. Aroma (7/12): Caramel, butterscotch, and malt come through. The fruity and hoppy aromas present in some 80 Shilling ales aren't visible here. 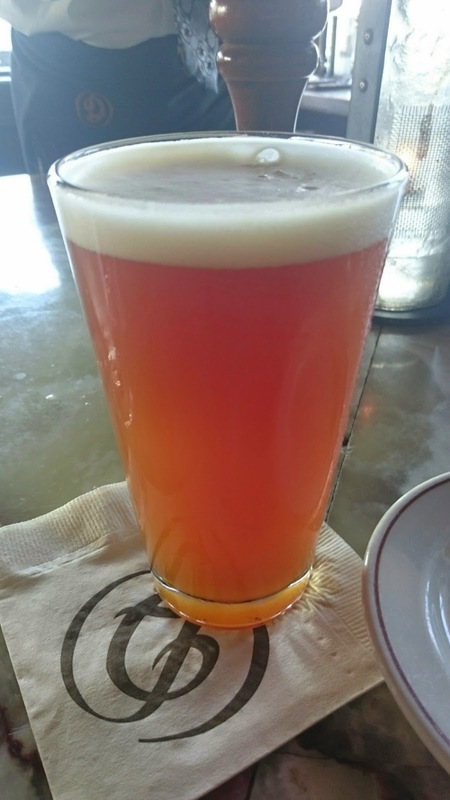 Appearance (3/3): Assuming it carbonates well later, it has a nice coppery color with a beige head. It's fairly clear but not crystal clear. It looks like I expect a good 80 Shilling to look. Flavor (15/20): It has a good combination of caramel and roasted malts, balanced against the hops, which provide a subtle fruity note to it as well. Mouthfeel (4/5): It's medium bodied, with a really silky texture from the oats. In fact, the oats might make it seem to have a bit more body than it should. Overall Impression (8/10): In terms of appearance, flavor, and mouthfeel, this beer hits most of the notes we'd expect it to. Aroma could be improved, perhaps with a more expressive yeast. Body could perhaps be a little thinner, by reducing the oats. Still, though, it's a good representation of the style. This beer is much better than last year's version, though I do see room for improvement. I'm thinking next time around I will dial back the oats and try using Lallemand ESB yeast, which worked well in an earlier version of my ESB. The yeast gave it the fruity note in the aroma that this beer lacks. I might also try putting a small amount of Bramling Cross at the end of the boil to give it a little of the aroma from that hop variety. 04/21/2018: Now that the beer has finished carbonation and bottle conditioning, it's gotten much clearer. It's now a brilliantly clear ruby brown. Carbonation is still fairly low, which is in line with the style. Butterscotch and fruit come through in the aroma. The flavor is malty, caramel, lightly toasty, with a touch of butterscotch and dark fruit. Finish is malty and lingering. 04/24/2018: The more I think about this beer and look at it, the more I think this might be the perfect base for the Belgian Dubbel recipe I've been trying to create. I'm going to have to try re-brewing it with Belgian yeast and hops, and see what I get. 05/06/2018: A few weeks after bottling, the beer has changed considerably. The buttery or butterscotch note I detected earlier is gone. The malt comes through much clearer, but is balanced well against the hops bitterness. It's very easy to drink. I'm not sure I'll change this one. Aroma (5/12): Some maltiness. No hops. A little too estery. Appearance (2/3): Lots of form upon pouring - off white. Pale copper color. Slight haze. Flavor (9/20): Malty, not very complex. Could use a little more toasty/caramel/roast. Esters are pretty high. Mouthfeel (3/5): Low body, carbonation is good, no warmth/creaminess. Overall Impression (5/10): This is a malty beer, kind of one dimensional. Add a little more specialty malt. Try to bring esters down. Not sure if high foaming is over carbed or subtle infection. Aroma (6/12): Low maltiness, biscuit notes, fruitiness, spicy and caramel. Appearance (3/3): Big head lasting ??. Off white creamy. Pale copper color. Flavor (7/20): Low ? to no hops very unbalanced. Some grassyness in aftertaste. Mouthfeel (4/5): Low to medium body. Gets thin soon. Creaminess. A little estery. Overall Impression (7/10): Somewhat thin for style and almost overly malty, while ? and ? recipe. So the beer's official score is about 10 points below what I thought of it, so I'm easier on my beer than the judges are, by far. It's always disappointing to produce a beer you're really pleased with, only to have it roasted by the judges as in this example. Last year's 80 Shilling attempt scored an average of 27, so this year's version (despite the fact that I felt it was much better) scored a couple of points lower. Clearly I have more work to do in producing a Scottish ale. Add some Aromatic malt to perhaps bring up the malt aroma. Add a late hop addition to bring a little bit of hops into the aroma. Change the yeast or use temperature control to keep it fairly cool. I didn't use any temperature control on this batch and perhaps it got too hot during fermentation. Increase the amount of oats to improve the body a little more. Allow more time to condition before bottling. I think the overcarbonation I've been seeing lately is a byproduct of perhaps not allowing fermentation to complete fully before bottling. I rule out infection because I'm very careful about sanitizing everything that comes in contact with the beer after the boil, even the thermometer... and there were no off flavors reported that could be attributed to infection. Add some flaked maize, which is a flavor element I detect in Belhaven Scottish Ale that I don't get from this beer. We'll see what happens when I get around to brewing v3.0. My first attempt to clone this beer was a dismal failure. For this version, I decided to dig through the clone recipes I could find online. As with many clone recipes you encounter, most of them contained no images of the finished beer, no indication of whether the beer had ever been brewed, and no reviews indicating how it compared to the original. 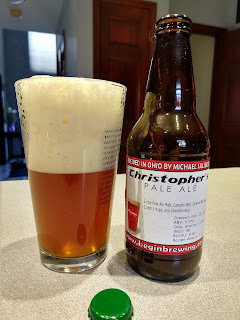 I finally settled on a recipe on one of the home brew forums which did actually have tasting notes under it, from someone who had reportedly done a side-by-side test against the real beer. I had all the ingredients on hand and put them to work last night. I used the High-Efficiency Mash profile with the Zymatic, and a 60-minute boil. While adding the hops to the hops baskets, I added three pellets of Summit to the two late additions to help increase the Summit flavor contribution and increase the bitterness a little. After the beer finished brewing, it was chilled rapidly with an immersion chiller and pitched into a sanitized stainless fermenter. A while later, some yeast left from a previous batch was pitched into the fermenter and it was sealed shut. 03/16/2018: Apart from slightly undershooting gravity and volume, the brew went as planned. The color seemed like it might be a little dark in the fermenter perhaps due to the 60L, but that can change after yeast activity consumes some of the sugars. I'll be back in a few days to report anything worth sharing. 03/19/2018: Tonight I pulled a sample from the fermenter for a gravity test. It registered 6.3 Brix, which is roughly half the original gravity. Since it's likely that this means we're near the end of primary fermentation, I added a generous dry-hopping of Cascade hops to the fermenter. There was still some krausen visible inside, so I think I chose the right time to dry-hop it. The sample tasted much more like a pale ale than v1.0 did. 03/24/2018: I bottled the beer today, directly from the fermenter. Yield was 23.5 bottles of the 12-ounce size. The rest of the fermenter was a solid cake of yeast and trub. A sample taken before bottling registered 6.3 Brix as it did five days ago. The hop aroma was noticeable, a mix of pine and grapefruit, as we'd expect for Cascade dry hops. I primed each bottle with a Coopers Carbonation Drop and two small carbonation tablets. I placed the bottles in a 76F "hot box" to complete carbonation. It should be ready to taste on Easter day. 03/29/2018: I decided to chill a bottle and see how it's coming along. Below are two images. The image with the bottle and the extra-thick head is my brew. The bottom image in the Manny's Pale Ale glass is the real beer. There's perhaps a little more reddish color to the real beer, but they aren't too far off. Having not had the real beer, all I can really tell you is how this one is. The color is a hazy reddish amber with thick beige head that lasts a while. The aroma is a mix of grapefruit, orange, and pine. The flavor starts moderately bitter, with a bit of malt behind it and hints of orange and other citrus. 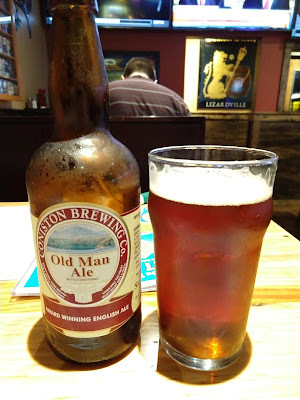 04/03/2018: The family member who loved Manny's Pale Ale said that he liked this one a lot, but that he felt it was "malty". I take this to mean that either I need to lower the mash temperature a bit (to reduce sweetness) or reduce the amount of caramel malt used. He also felt it was overcarbonated, and it probably is. Next time around, I'll drop the Caramel 60L and reduce the 40L by a couple of ounces. I'll also drop the mash temperature by a degree or two, and perhaps dry-hop with some Summit as well. 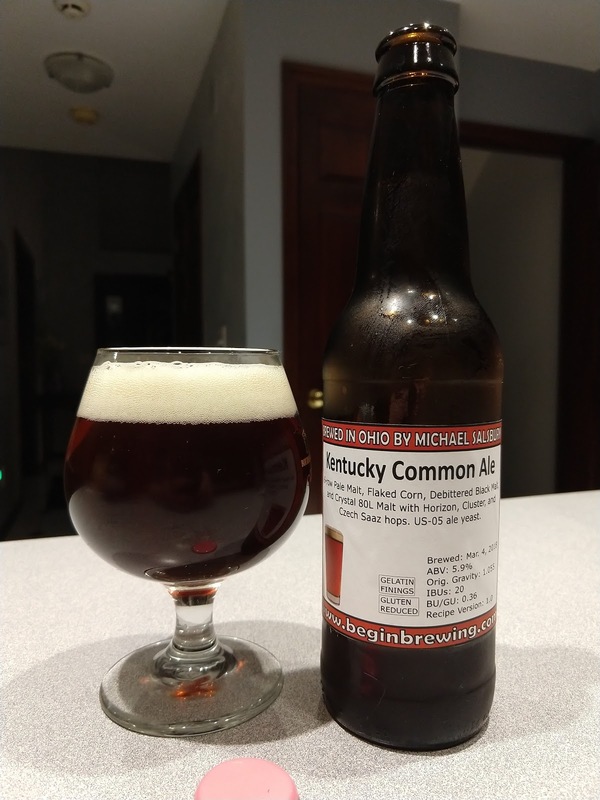 I read about the Kentucky Common ale style, and saw a presentation from the American Homebrewing Association about it online. This is a pre-Prohibition era beer predominantly made in the Louisville, Kentucky, area. It featured a significant amount of corn in the grist, along with six-row pale malt, and just enough specialty malts to darken to an amber or brown color. It used a mix of American and European hops, and a clean fermenting yeast. Traditionally, it was served fresh and not stored long enough for refrigeration to be an issue. 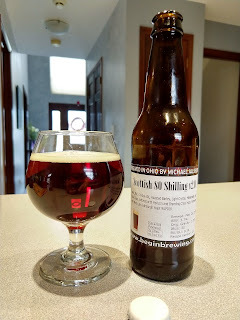 I crafted my own recipe for it based on the guidelines referenced by the Beer Judge Certification Program and the American Homebrewing Association and brewed it today. This is well outside the alcohol level for the style (5.5% max), so I planned to dilute it after brewing to be within the guidelines and increase the batch size. My target for the batch was an original gravity of 13.2 Brix or 1.055 SG, within the Kentucky Common guidelines. My actual gravity was 13.2 Brix (which for my refractometer's setting is 1.055 SG) and my volume was approximately 3.4 gallons once diluted with sterile distilled water. 03/04/2018: I had rinsed the Zymatic the day before, after brewing and later deep-cleaning it. I performed multiple rinses and had forgotten to remove the final rise water from the step filter before brewing. Because of this, the mash water volume pretty much hit the maximum amount the step filter could hold without overflowing. Despite that, the beer's gravity after brewing hit the 1.070 SG target expected by the recipe crafter software. Diluting that down to 13.2 Brix or about 1.055 SG took most of a gallon of sterile, distilled water. I chilled the wort down to 68F and pitched the dry US-05 yeast on top of it. I sealed the fermenter and left it to its own. Given the small amount of wort and the ambient basement temperatures this time of year, temperature control shouldn't be necessary. Worst case, moving the beer to a cooler corner of the basement should provide enough cooling (I proved that with an earlier lager brew). 03/11/2018: The fermentation appears to be over, so I treated the beer with gelatin and moved it to a secure outdoor location so that the "near refrigeration" outdoor temperatures could help clear up the beer, as I am hoping to enter it into competition soon. With 3-6 days in the cold, the gelatin should brighten it up nicely. 03/16/2018: I brought the beer back indoors to warm up a bit before bottling. Took a final gravity reading, which the refractometer measured as 6.9 Brix. After conversion to SG and adjustment for the wort correction factor, that's 1.010 SG, meaning that the beer reached an ABV of 5.9%. 03/17/2018: The beer has been bottled, using carbonation drops for priming. 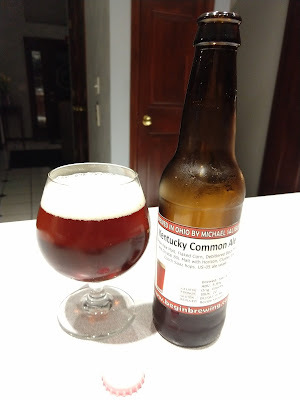 The BJCP notes for the style indicate that this is a "highly carbonated" beer, so for the first half of the batch I used a large Coopers carbonation drop and two smaller carbonation tablets. 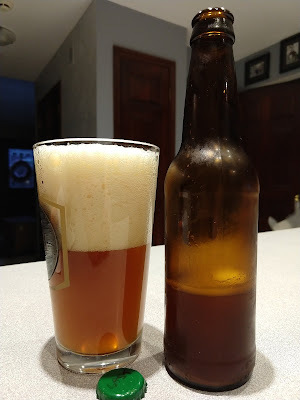 After noticing a lot of foaming in the bottle for that first half, I was concerned that the residual carbonation in the beer might be higher than expected (resulting in bottle bombs), so I bottled the second half with only a single large carbonation drop. I marked the batch with the extra small tablets to identify those bottles later. 03/28/2018: I opened a chilled bottle tonight. As you can see in the photo at the start of this post, the beer is a deep coppery brown color with a finger-thick head that lasts a while and leaves behind rings of beige lacing. The aroma is definitely malt-forward with a clear sweetness. The color may be a little too dark for the style. It's slightly hazy, but almost clear enough to read through. The flavor is malty, slightly sweet, but with enough hops to keep it from being cloying. The finish is clean and malty. It's definitely in the medium-body category, too. All of this, except perhaps the darker color, is in line with the BJCP guidelines. It's a very easy to drink beer. I'm definitely planning to enter it into competition. Corn first, followed by caramel and roast/toast. No pick up on hops. DMS and corn aromas are too much. Should be noticeable but not overpowering. Corn, malty sweetness, light caramel, slight biscuit. No hop aroma. No DMS. No diacetyl. Good color and clarity. Nice lacing. Deep copper with a thick creamy head that lingers. Brilliant clarity! Corn sweetness. Roasted malt. Some dark fruit (raisin). Earthy hop flavor and a balanced bitterness. Caramel. Light cocoa dust, noble hop, faint red apple-skin, hop-spice, toast. Good taste and complexity. Corn, then caramel, then toast. A pleasure. Pale malt and corn. Slight apple character. Could use more caramel sweetness. Medium bodied. Dry lingering finish. Should have more creamy character. Medium carbonation with a dry finish. No astringency. Great. A teeny-tiny bit sweet at the very end. Light body with high carbonation. A little too much corn character with little focus on caramel malt. This beer hits the nail on the head. Corn flavor is present but not overbearing. Roasted malt character adds complexity. Great job! Very well done. Clean, excellent clarity of flavor. Could be a touch drier on finish, but that's a quibble. Given that the style is supposed to be somewhat "corn-forward" I did fairly well there for a "version 1.0" recipe. Next time around, I think I'll drop the corn down to 2 pounds instead of 2.5. To replace that, I'll drop in some Caramel 40L to try to add a little more caramel and complexity. I may also increase the aroma hop addition to dial up that part of the aroma, too. Aroma (7/12): Medium malt sweetness with notes of bread first, low corn aroma noted. No hop aroma noted. Appearance (3/3): Copper in color with a huge dense tan head that lasts forever. Very clean. Flavor (11/20): Medium high malt sweetness with notes of bread. Medium bitterness. Clean. No corn flavor noted. Low hop spice is noted on the back end. Mouthfeel (3/5): Very dry. High carbonation. Light in body. Overall Impression (6/10): Nice beer. The lack of any hop aroma. Aroma and more importantly, interesting malt character holding the beer back. Aroma (8/12): A caramel malt ? is present. No hop notes as required in guidelines. Malt ??. Appearance (3/3): Color on. Large head. Belgian lace present. Clear beer. Orange ?? Flavor (9/20): Sweet on opening taste. Dry finish is present. Bread notes present. But not much. Sour note also there. Mouthfeel (3/5): Body medium. Carb OK on first taste. Dryness at end. Overall Impression (5/10): Lacking some of the notes needed for this style. A good try. Increase the amount of aroma hops at the end of the boil to dial up the hop aroma. Dial back the carbonation (which I've known is a problem in several recent beers). Decrease the amount of corn slightly to allow malt to come through more. Examine some other Kentucky Common recipes to see what other barley malts are being used in them, to see if malt complexity can be dialed up. Consider adding some corn sugar to dry it out a little. Re-brew the beer closer to the competition date, as perhaps three months is too long for this style to sit before competition... since the Barley's judges rated it much higher when it was a little over a month old. I don't want to change the recipe too radically because I like it as it is, but some minor tweaks could improve it. While out to dinner at a local tavern, I had the opportunity to try Coniston's Old Man Ale. I found it to be an enjoyable and slightly tart brown ale. 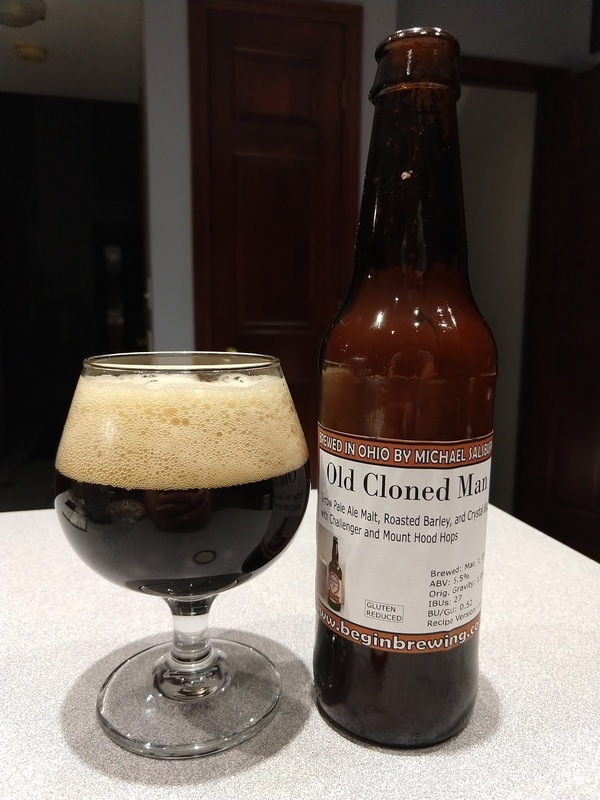 Looking online, I couldn't find a clone recipe, so I decided to see if I could create my own. Description: "A radically different beer... it has roast barley added to the pale and crystal malts. It has a deep burnished copper color, a rich port wine aroma, a big chocolate and creamy malt palate and a dry, grainy, roasty finish balanced by hop bitterness and tart fruit. It is a remarkably complex beer that deepens and changes as you sup it." The Beer of the Month Club says that you should drink it at 58F or you miss a lot of the nuance. They describe it as "extremely toasty, crackery, with fruity notes favoring orange tones, but grounded in a robust earthiness." Another web site suggested that the "Pale Ale Malt" referenced on Coniston's site was actually Maris Otter, so I may try that in a future version if this doesn't work out. With all of this in mind, I came up with the following first crack at a recipe and brewed it today. In retrospect, I probably should have gone with Maris Otter for the Pale Malt, but that didn't occur to me at the time. If I re-brew this, I'll go that route. I chose Crystal 80L because it fits in somewhere between British Medium and Dark Crystal malts. Since one of the descriptions I read said that Crystal was added for color, a darker malt seemed more appropriate. Challenger is a dual-purpose hop, used for both bittering and aroma, so I decided to leverage it throughout the boil. Mount Hood is more an aroma hop, so I added it nearer the end of the boil to allow it to serve that purpose. It wasn't a particularly bitter beer, so I went for enough hops to fit into the middle of the English Brown Ale BJCP range, but no more. 3/1/2018: I loaded the Zymatic step filter and keg, then started it brewing. There was a bit of foaming on top of the step filter lid, but no wort made it into the drip tray or onto the table. The brew yielded about 2.3 gallons of beer at a much higher gravity than the recipe crafter estimated, so I added some distilled water to bring it to the full 2.5 gallon batch size. Even at that, the gravity was higher than expected. I pitched the wort, the full packet of yeast, and Clarity Ferm into a sanitized fermenter and sealed it up. I then went about cleaning the Zymatic, including running a deep clean session. During the rinse cycle, it became clear that one of the hoses is dripping. I've reached out to Picobrew for assistance as the hose clamps used are an unfamiliar type that requires a crimping tool I don't own - so tightening them is probably not an option. 3/2/2018: About 26 hours after pitching the yeast, airlock activity was taking place. The thermometer showed that the beer was below the yeast's ideal fermentation range, so I attached temperature control to keep it at or above the low end of the range for days 1-3, then push it toward the upper end after that to ensure it finishes out completely. 3/11/2018: Today, my wife and I bottled the beer directly from the fermenter, priming each bottle with a Cooper's Carbonation Drop to ensure a consistent and mild level of carbonation. Yield was 24 bottles. The room temperature, uncarbonated beer seems well-balanced, with a hint of roasty grain and chocolate to it. I'm hopeful that it will be even better carbonated. It should be ready to do a taste test on March 18. 3/17/2018: I opened a bottle today to sample. The carbonation seemed a bit low, which was disappointing. The flavor, however, was excellent. It reminds me more of a Foreign Extra Stout than the Old Man Ale I was aiming for. While being reminiscent of the Coniston beer, it was not tart as I recall that beer being. This one is also considerably darker in color than the actual Coniston beer. That said, although it's not a very good clone of Old Man Ale, it's actually a very tasty beer and one I'll likely brew again. To get the beer closer to the original, my plan for next time is to replace the Pale Malt with Maris Otter, switch to a lighter Crystal malt, and see if I can get the color down into the SRM 12-14 range to get closer to the actual beer's color. I'm currently thinking something like 3 pounds and 2 ounces of Maris Otter, 6 ounces of Light Crystal (or Crystal 60L if I can't get that), and the ounce of roasted barley.